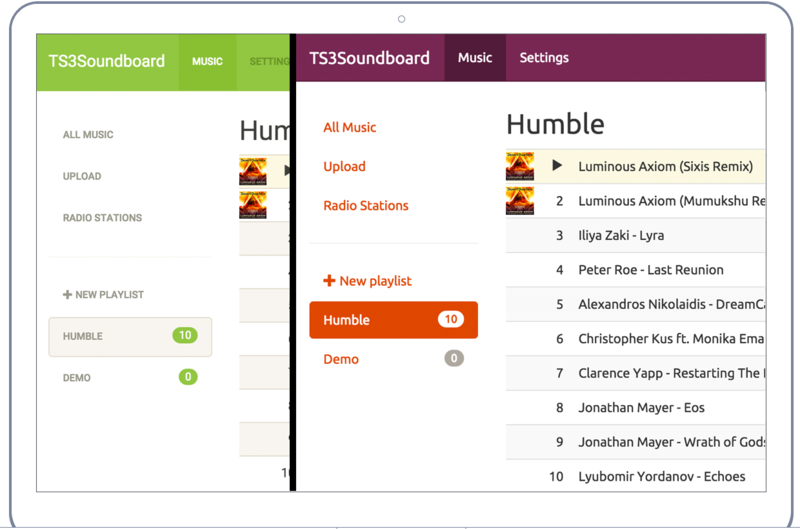 SinusBot - Music for your TS3 and Discord! Welcome the Simple, Elegant & great sounding TS3- and Discord-Bot! If you already have a TS3-Server running or own a VPS or Root-Server you're just a few simple steps away from your own Bot. 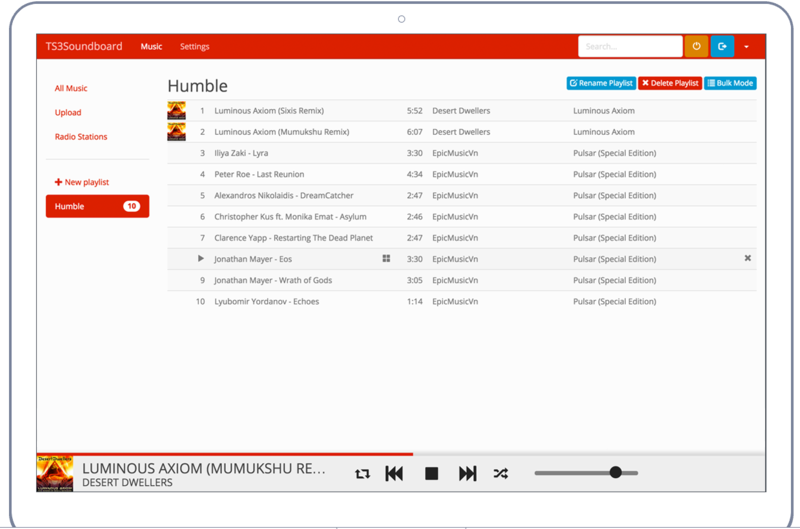 Simply upload files or let your friends upload files and listen to them together. You can also download files from popular services and listen to them. You don't need a new virtual machine or a huge Java installation. The bot is tiny and tries to do its best not to waste resources. A running bot will only take a few megabytes of RAM and little CPU usage. You decide what your friends can do with your bot and grant more privileges to those you trust more. The Bot offers more than just a command line interface. Everything is just a few clicks away. The bot has been designed with simplicity in mind. So I've tried to not overload its interface with things you don't use all the time. Your friends won't have to read manuals to figure out how everything works. Uploading files is as simple as dragging them from your desktop to the browser. Downloading from the Cloud is barely copying a link. Want to listen to radio streams? There's an integrated directory of stations that you can start with just a double-click. 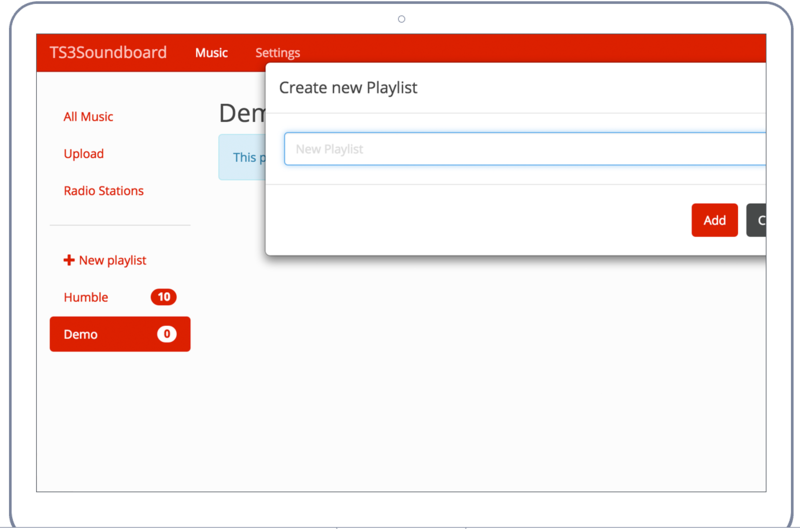 With just a click you can create a new playlist and then directly upload files to it. 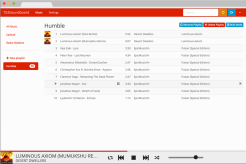 You can re-arrange the order by dragging & dropping just as you do on your desktop player. In the future the bot will also get a folder-like structure for even more organization. Even your friends can have their own folders. Having a whole Clan, Guild or Alliance with different tastes of Music? Just create another bot and let it play for another audience. 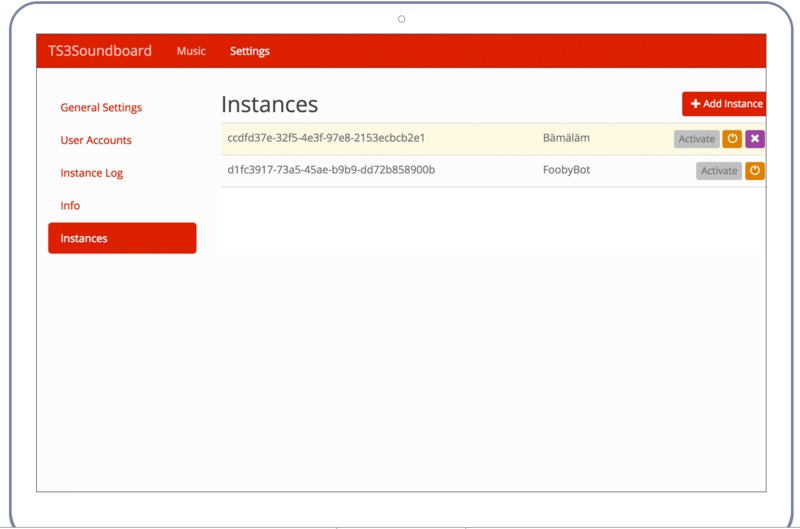 No need to start another instance, it can all be controlled from within the web-interface. You also don't need to re-upload files again, as files and users will be shared between the bot instances. Okay, well... Almost everything. The bot has the great FFmpeg library built in so that it can playback dozens of audioformats (like mp3, aac, flac) from dozens of containers, even videofiles. And if it isn't enough to just playback the files you've uploaded, you can make the bot use youtube-dl to fetch content from your favorite video & audio sites. Don't like the default design? There are plenty of themes to choose from, you can preview them here. In the future there probably will be support to integrate your own themes. Since everything is built on top of Bootstrap, there's plenty of tutorials and free themes out there. Did I forget to mention that it's free for personal use? The Bot is currently still in beta - it should only be installed by advanced users. Make sure to read the instructions for Ubuntu / Debian or use the install script (thanks to Qhiliqq). It may work on other distributions as well but that hasn't been tested. Just follow the instructions of the installer and start with the shortcut on your desktop. As mentioned, the bot is free for personal use. If you intend to use it commercially (e.g. to make money by renting it), you need to contact the author for a special agreement. Even if the bot is free, it has cost the author a lot of time. So if you want to support further development and updates, please consider a small donation. If you have trouble installing the bot, head over to the forums. Feature requests can also be made there, but please make sure to use the search before posting. Many things have already been asked before and the author will not respond to or directly close questions that have been asked before. Don't own a server or want somebody else to take care of the maintenance? Here are some of our partners that will gladly host a bot for you. © 2013-2018 Michael Friese. All rights reserved.